I'm not the adventurous type but recently my friends from college suggested to make a trip to Kedah & Penang. Part 2 would be to Johor & Singapore but we'll leave that for later. We've had it all planned.. We'll take a bus to Kedah, stay with a classmate for 1 night, attend another classmate's sister's wedding the next morning then off we go to Penang, where we will stay a night or two before flying back. There's only one problem though.. Where are we going to stay in Penang?! Sleeping on the streets is definitely out of the question. We are all still students and cannot afford fancy hotels. 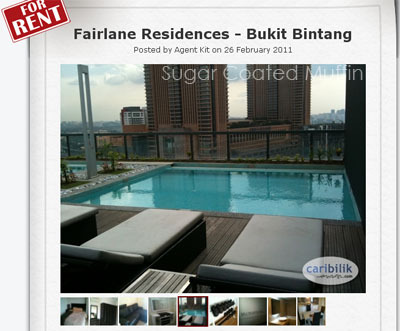 Then I chanced upon a site where we can get rooms from as low as RM50 for 3 pax. Almost unbelievable right? Didn't know these kinda things also exist in Malaysia. Thought only the guai lou countries have it. After some clicking, I discovered CariBilik Homestays also has rooms in KL (actually they have rooms all over the country). I get car sick on the bus and I'm not sure how I'll react to being in a plane so staying nearby is safer =x Hey.. It'll be like a sleepover except you can stay up late chit chatting without your parents scolding you =x I can invite my classmates from Kedah, Nilai, Johor and wherever else to come join me too so we don't have to travel all over Malaysia to see them. Yay! The rooms go from budget basic rooms to more comfortable hotel rooms (which obviously cost more). There are a few shots of the place so you can have a peek at how the place looks like. 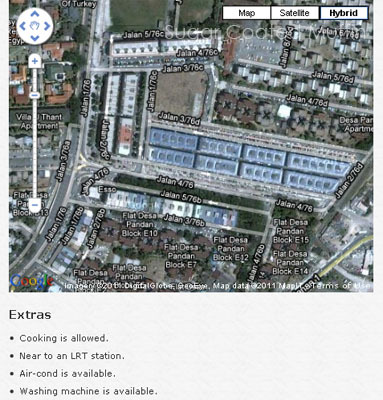 There's also a map and other details like if you can cook, which public transport is it near to etc. And to make planning your trip easier, they also provide a calender with available dates. Isn't that just convenient.. ^_^ Now I just gotta convince my friends to have a stay-cation instead! Today electronic media is a important part to progress our business. This post sharing some review to create Bed & Breakfast rental services website. It's put out all the information which is helpful to choose a reliable breakfast services. These are beneficial service to find a preferable break fast from any where.